Of course, U.S. and Russian citizens don’t know the background machinations of the joint space effort between our two countries, nevertheless it begs the question if we can seemingly cooperate with the Russians/Americans in space why can’t we just get along on Earth? In the meantime, we can only hope the space/mankind project survives the harsher elements on the planet than those out in the vacuum of space. 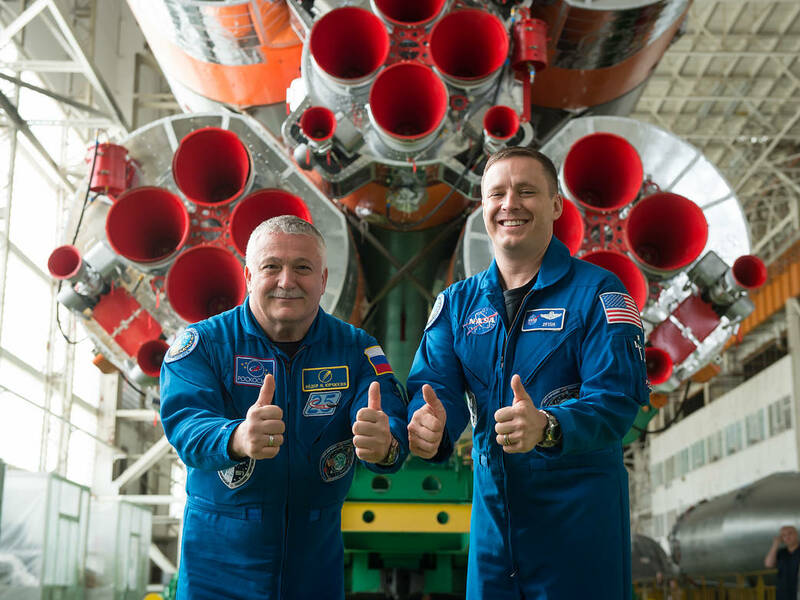 Here’s an image from the Integration Facility at the Baikonur Cosmodrome in Kazakhstan, Expedition 51 crewmembers Fyodor Yurchikhin of the Russian Federal Space Agency (Roscosmos, left) and Jack Fischer of NASA (right) provide a "thumbs up" as they pose for pictures in front of their Soyuz booster rocket. Fischer and Yurchikhin will early morning (Eastern time/US) April 20 on the Soyuz MS-04 spacecraft for a four and a half month mission on the International Space Station. Godspeed.